As I sat on the train out to my mom's house last night, and in between cat naps, I pondered Vermont. Everything I experienced, everything I did, everything I did not do...everything. I should probably put this in some sort of race log or something, but right now I feel like sharing with you what I took away from the whole experience, now that it's been over a week since finishing. A first 100 is "kind of a big deal" so I want to remember what exactly I did so that I can learn from mistakes and from good decisions. -One S!Cap every 45 minutes for the first 70 miles, then pulled back slightly and one per hour the remaining time. -Carried one bottle of plain water, and one bottle of Perpetuem per hour the entire race. After Bill's (~mile 88) I wasn't as disciplined, but the swelling in my hands did go down so I'm thinking I did something right. At mile 70, I was up a total of 6 pounds (yowza!) so I was asked to ease off the liquids a bit. Puffy hands, and I could tell my feet were swollen, but they weren't as noticeable as my hands were. -Two Clif Shot Bloks or 1 gel per hour the entire day. By mile 88 the taste of either of these was even less desirable than lima beans (and I hate lima beans! ), but I still choked them down on schedule and never had any true nausea. I did get short bouts of it towards the end, but I think that was mostly due to the fact that I was tired of everything and just wanted a big ol' hamburger! -At every crew accessible aid station, I had a chocolate Ensure. And throughout the race, I had about 3-4 Starbuck's Doubleshot drinks. When I was hanging low on the energy scale, Geof was always ready with one of these and boy did they not only wake me up, but they gave me a serious boost of happy energy! I felt good about 15 minutes after drinking a Doubleshot, yum! -Due to my awesome intake of liquids I was peeing like the dickens! I'm not sure if it's bad or not, but about 60 miles in I needed to answer nature's call close to every 20 minutes. I washed my feet with soap and water twice (maybe even three times) when I saw Geof, and put on clean socks 5 or 6 times. I also brushed my teeth twice. Seriously, brushing my teeth made me feel like a new woman each time. Changing socks was pure heaven, and even more so when my feet were fresh and clean! Changed my shoes, from my Cascadia trail shoes to my Glycerin 7 road shoes, at mile 47. My feet were feeling bruised from all the pavement-like pounding on the gravel roads, and the shoe swap made a huge difference. I started out in Drymax Trail Lite socks (love those), but after 21 miles, I needed a change, and to pop some blisters. What?! Geof lubed up my feet generously with Body Glide every time I saw him, and I changed my socks each time to another pair of Drymax (either Trail or Run Lite's after my first pair), until mile 70 when I decided to just eff it and put on a pair of hyper thin Nike Dry Fit socks under a pair of Smartwool. No additional blisters after that. Hmmm. The blisters I already had from the day stuck around, and at Bill's a medic looked at them and said they were just calluses. Um, no, sorry, that's liquid in there! Ain't no callus! They wouldn't do anything with them, so I replaced my socks and was happy again when they were numbed once more a bit down the trail. At the finish line medical tent, the head doc lanced my blisters and put iodine on them. He said from now on to wear only socks made of the stuff that Drymax is made of (starts with a P, but can't think of it now) and to never put sticky stuff on blisters (ie tape of any kind, moleskin, etc. ), which sounds completely ridiculous to me, but hey, he's the doc, not me. -Soap: for cleaning feet and hands and making you feel fresh as a daisy. -Clippers: for nails the night before the race when you suddenly realize you forgot to clip the tootsies down. -Body Glide: a big ol' thing of this stuff might get you all the way through the race. I was glutenous with this stuff! -Toothbrush/toothpaste: for removing the sweater-like feeling on your teeth from hours upon hours of ingesting Perpetuem and Shot Bloks. Gross. -Small cooler with ice: for the Doubleshots and Ensure...nothing beats cold drinks during a hot race! -Vaseline: to help fend of "fire in the hole". Note to self: apply before it becomes an issue :) You can also use Body Glide for this, but I wasn't too keen on using that on the rest of my body if it had been 'other places'. -Ziplock bags: to separate everything so stuff is easy to find...I had a blister bag, a batteries and headlamps bag, a Blok and Gu bag, etc. Helps keep things kind of organized. -Drop bag-like bags: for just in case you decide last minute to put together a drop bag. At Vermont, with a crew/pacer combo, this was very easy to do midway through the race as Geof was able to stop off at 10 Bear and Bills on his way to the shuttle bus (to begin pacing duties) and drop off drop bags for us so that we weren't SOL once he began pacing. Worked out great! I had four pair of shoes, but only used two. I liked knowing I had other options though. I had more than enough clothing to clothe a third world country, and used maybe 10% of it, but I was also glad to have options here, too. I changed my shirt once, wore a versatile jacket for wind/rain protection that has removable sleeves so once the sun was up I took the sleeves off and wore it as a vest most of the day, one pair of Moebens (the eco sleeves) that were great for the night running portions when I didn't feel like putting the sleeves back on the jacket, a bandanna for cleaning my glasses if I smudged them, my Nathan vest to carry camera, Bloks, Caps, Perpetuem packs, discarded clothing items, etc. I faithfully wore my chili pepper shorts the entire race, but I really thought I had put a pair of shorts in my Bills drop bag, so that's why I stuck with the same shorts all race. They were just fine, but a clean pair would have felt good at mile 88 :) I had on my Headsweats hat the entire race, too. It's a great hat and it doesn't let sweat pool on your forehead. Very comfortable. My favorite part :) While I sat in the medical tent, Geof brought me a PB, honey and banana sandwich to munch on. Delish! I ate a hotdog at lunch and some kind of vegetable pasta salad, drank water, and about a gallon of Powerade! On the drive back to Burlington, I munched on our trail mix, took my vitamins (I made sure I kept up on these throughout the weekend), drank 20 ounces of Succeed Clip 2 (per Karl King's instruction), and then continued with the water. That night, I devoured a Whopper (yummmmm!) and fries, then thought I'd explode, but not before taking the first packet of Succeed Recovery vitamins. I followed this up for three more nights. You take one packet each night for 4 total nights after a very hard effort (ie any ultra event, really). I should also note that a half hour before the race began, I took the Succeed Pre-Race vitamins. As I had very little muscle soreness in the wake of this, I'm going to sing Succeed's praises and continue with the Pre-Race/Recovery packs in the future. Don't try to run 21 trail miles in the hills of Vermont without first checking to make sure you have packed enough Perpetuem and S!Caps for the distance. How did I forget to do this? I don't know, but thankfully Dave S. and Sean A. were generous enough to give me some salt caps to cover me for the time being. Thank you, thank you!!! Don't assume there will be water at every aid station...when you're in the back of the pack :) The first three stations didn't have any water. That sucked. Be proactive about feet. Fix them before their a problem, or as soon as you notice any pains. Makes a big difference! Eat throughout. I can't imagine what my stomach would have been like if I hadn't done this. Have a crew who will understand what you're saying even when you sound like you just celebrated your 21st birthday...in Cancun...and fell asleep with a bottle of tequila. Geof totally got it and if I couldn't form a coherent verbal sentence, he had suggestions at the ready and each time he was right :) He was also a maniac with the Body Glide on my feet! Always have extra batteries on you. You just never know. Memorize song lyrics ahead of time if you're not allowed to wear an mp3 player. This will come in handy in the lonely hours when you are bored out of your mind, and will keep you from going nuts repeating the same line over and over again because you don't know the rest of the lyrics...or prevent you from singing Christmas carols in July. Keep your spirits up! Being and feeling happy during this kind of an event is tough, but it makes a huge difference in the outcome. Who wants to slog through a hundred miles in a crappy mood? That's about as desirable as doing it injured. Have things along to cheer you up, bring a crew/pacer that you know...the lift you get from anticipating and then seeing a familiar face along the way is incredible...tell jokes, talk to other people...you never know who you'll meet, or what you'll learn from others...and make sure to laugh at yourself when you find yourself getting down on things, or you trip and fall, make a wrong turn, or what have you. Just laugh it off! You paid to do this, so have fun with it! Well I think that about does it. I consider myself pretty darn lucky! I feel great, don't have any real complaints other than some bruise-like pain on the tops of my feet, in the aftermath. My knees and shins never really bothered me (my main concerns going into the race). I had some pretty decent soreness in my quads, but everything else was nonexistent within two days, and I was walking normal by Wednesday. I was able to climb the stairs to the 2nd floor of the bed & breakfast the night after finishing without much trouble, though it must have looked pretty funny :) And, aside from the tough 3-mile run I had on Saturday, I feel pretty ready to get back at it...slowly, but surely. Not bad for a first hundo! I noticed you said "not bad for a FIRST hundo". Does this mean you are going to be doing this again? Of COURSE I want to do this all again. Was there ever a question? My list of possible next hundreds is growing and growing! Very nice post it will come into hand on my first 100miler. I do have one question did you drink a bottle of plain water and Perpetuem every hour? I thought this *was* a "race log". :) That's a great follow-up to your race report. Lots of good info. Yes, one bottle of water AND one bottle of Perpetuem per hour (so 40 ounces of liquid every hour). This meant I needed to reduce my calories a little bit elsewhere, since Perpetuem has a that and carbs in it already. So it's all a matter of trial and error, and seeing what works for you. I am glad to read you will be doing more 100's! You looked really strong when we were running together and at the finish. This write up is definitely helpful to other ultra runners because we might as well learn from each others successes (and failures). You are right that there were issues with water early in the race...as I was running this, I recalled the same issue last year (which was alot hotter). I must have unconsciously recalled this because as I headed out at the start I was completely hydrated with a variety of beverages and had just topped off my water. Paige, congratulations! And thanks for writing with such detail, I feel like I learn so much reading it. You are so right about staying positive all through the race and not taking yourself too seriously. This was tough for me in some places (thr first 20, and around miles 40 and 80). I had to constantly remind myself: "You love this! This is what you spent a year training for!" Awesome post, Paige. I learned SOOO much, and will definitely revisit this if/when I get brave enough to tackle ultras!! Congrats again--I am just still in awe! 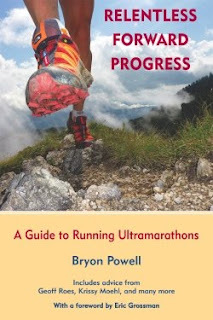 LOL, IC, yes, definitely revisit this one cuz' if you continue to read my blither you are most certainly going to take a stab at an ultra someday soon...I'll even guarantee that one for you :) Mu hahahaha, I love ultrarunning! !